You really can’t leave me around a jar of peanut butter. It will be gone before you know it. This Easy Peanut Butter Fudge has always been one of my favorite holiday sweet treats. At Christmas time, I always make batches of it. If you enjoy making fudge during the holidays, be sure to check out my tips for making perfect fudge to get great results every time. Heck…anything with peanut butter is a favorite of mine. I’m a bit like Claire from Lost in that regard. This recipe is one that my aunt used to make that I have adapted. It sets quickly and is pretty much fool proof. One of the ways to tell if fudge will set quickly is to see if the recipe contains marshmallow cream. There is something about adding it to a fudge recipe that makes a believer out of those of you who don’t think they can make good fudge. This one sets VERY quickly! The fudge texture is amazing. It is sweet and creamy with a lovely crispness that comes from perfectly set fudge. It will even stay set if it’s stored outside of the fridge. See more fudge recipes here. 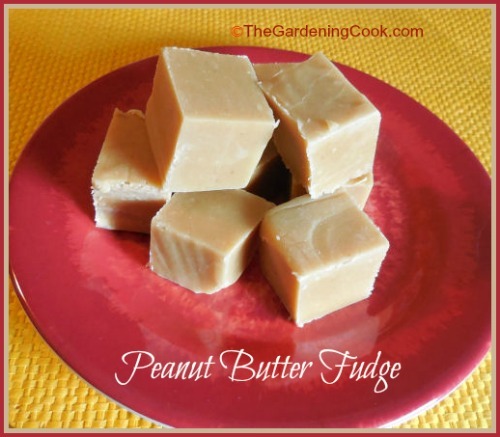 This peanut butter fudge recipe is a family favorite. It sets quickly and is fool proof. Line a 9x13 inch pan with aluminum foil or parchment paper. In a medium saucepan, combine the sugar, evaporated milk and peanut butter. Cook the mixture over a medium heat stirring frequently until it comes to a boil. Continue boiling for 10 minutes, remove from heat place the pan in a sink partially full of cold water. Stir in peanut butter and marshmallow creme beating thoroughly by hand. This will set quickly so don't waste any time. Pour into the prepared pan and chill until set. Cut into squares and serve.